Ingredients: Butter, Alimentary Protein Extract, Summer Black Truffles (Tuber Aestivum Vitt) 6% Use within 90 days of defrosting. Keep Frozen and use what you need. Made by Urbani, Recommended uses: this butter is an original blend of intense and rich flavors. Use on toast (white, brown, whole meal, as you wish). For canapé or as a pasta sauce, or even while cooking meats. This item is Perishable and needs to be shipped Fed Ex overnight. 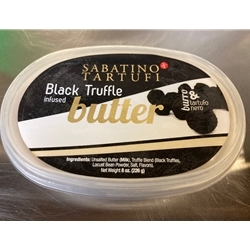 By Urbani, Ingredients are Butter, Alimentary Protein Extract, Summer Black Truffles (Tuber Aestivum Vitt) 6% Use within 90 days of defrosting. Keep Frozen and use what you need.